There are over 200 species of Formica rufa - the scientific name for Wood ants. As the name suggests they are most commonly found in woodlands but some species are also found in grasslands. Woodlands are the perfect location for these insects as they use rotting wood and tree stumps for their nests. Wood ants collect pine needles, twigs and woodlands debris to create a “thatch” exterior. This works like a sun trap which keeps the inside of the nest warmer than outside, but in the height of summer the nests can get dangerously hot. Wood ants combat this by making holes in the exterior as ventilation to let cool air in and hot air out. These nests are really large cities - often with over 100,000 ants living there. Wood ants' diet consists mostly of insects scavenged from the woodland floor. One colony may consume around 10 million insects over a year. Interestingly, the ants also farm aphids for food. The aphids feed on the sap from the trees then excrete the excess sugary substance as honeydew. The ants then “milk” the honeydew from the aphids by stroking them with their antennae. In return for this the ants protect the aphids from predators and parasites. Wood ants are sometimes known for their strong smell, which is because when wood ants are disturbed they spray a pungent formic acid to protect themselves from predators. It has been found that some birds visit wood ants nests to be deliberately sprayed, as the acid helps to repel lice and mites. Deforestation and urban expansion are strongly linked to the decline of wood ants. Places like Burnham Beeches where our new film was made are working very actively to help protect these species. 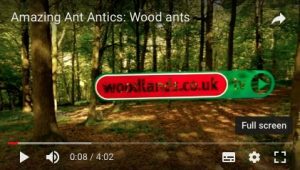 Good video with expert information about wood ants. It is to be hoped that private woodland owners exercise responsibility in caring for, and fostering the diversity of wildlife in their charge.